Aetheric Dreams has posted up a free, playtest version of their The Great Game rules for you to check out and give your feedback on. 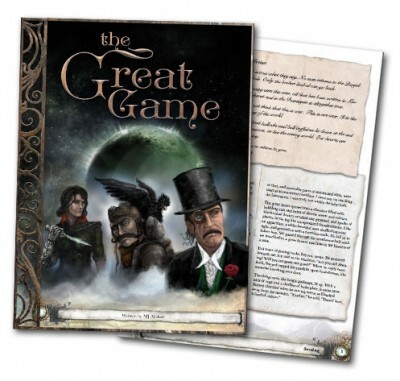 The Great Game has been released as a freely available playtest until January. From Aetheric Dreams, creators of the ENnie and Origins nominated Nights of the Crusades, it offers an original Lovecraftian steampunk setting in the time and place of the historical Great Game – when the British and Russian empires fought over Central Asia. The rules system is also original, though it shares a distant ancestry with that of Nights of the Crusades. Aetheric Dreams are asking for feedback on how your gaming group interacts with the rules and setting. Character creation is completely open-ended, with samples including empire agents, sentient robots (calling themselves Aton), beastmen (escapees from Dr Moreau-esque scientists) and others drawn from Victorian-era fiction and history. A detailed timeline also gives players an introduction to events and scientific advancements over the past 50 years before the campaign begins. Characters begin play with a mysterious letter. It contains travel details, currencies and a map to a destination where the Gamemaster’s first adventure takes place. The campaign goes from 1845 until 1945 – the end of the world (which could happen in numerous ways, though guidance is offered in the form of Al-Tughrai’s Prophecies). However, time travel seems like a possibility for characters who fail in their quest (a reference to The Time Machine by H.G Wells). The Great Game is available as a free download until January.